Fresh Products Washer Fresh is the safe-to-touch cleaning product that powerfully, safely and conveniently combats odour-causing build up in high-efficiency washing machines. Our Power Pack pouch contains a potent oxygenated bubbling action formula that is designed for high-efficiency washing machines and is proven to reduce odour-causing mild and mildew. Washer Fresh is safe to touch with no unwrapping required - just drop it in and your done. Our convenient pre-measured Power Pack pouches are a breeze to use and will keep your laundry smelling fresh and clean, wash after wash. Washer Fresh is incredibly cost effective - just use one Power Pack pouch per month. Washer Fresh dissolves completely, is septic-tank safe, environmentally friendly and biodegradable. 1 Package of Washer Fresh contains 3 Power Pack pouches. Concentrated crystals that mix with water to make a mild, safe to use, acid cleaner. Removes dried Portland cement, grout haze and mortar residue from tile, concrete and masonry. Safe for use on coloured grouts. Removes hard water deposits, efflorescence and also etches concrete. TileLab<sup></sup> No VOC (Volatile Organic Compound) formulas help to provide better indoor and outdoor air quality compared to similar traditional products. 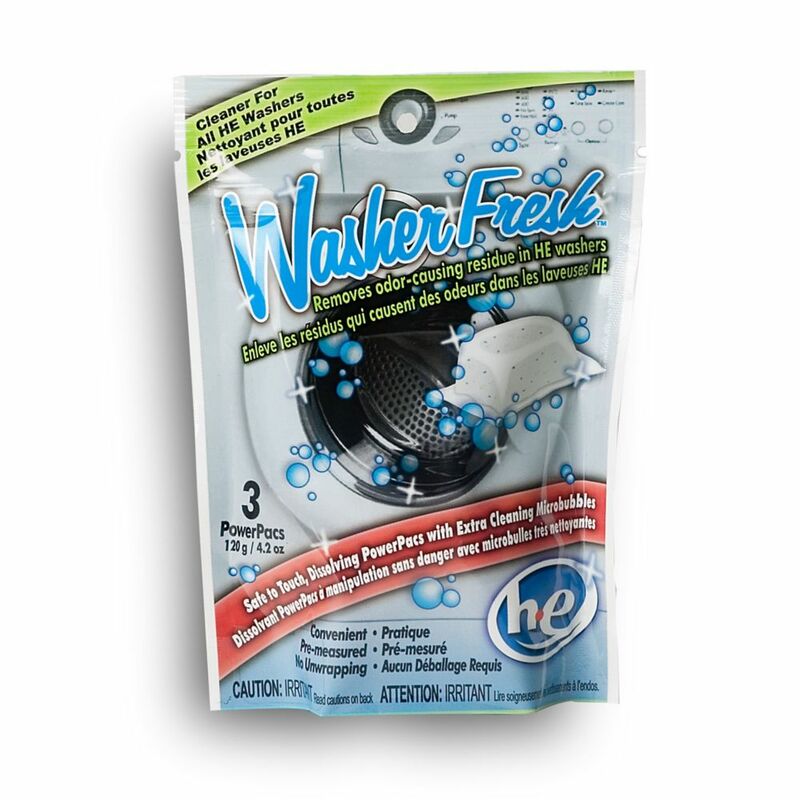 High Efficiency Washing Machine Cleaner & Refresher 3 Pouch Fresh Products Washer Fresh is the safe-to-touch cleaning product that powerfully, safely and conveniently combats odour-causing build up in high-efficiency washing machines. Our Power Pack pouch contains a potent oxygenated bubbling action formula that is designed for high-efficiency washing machines and is proven to reduce odour-causing mild and mildew. Washer Fresh is safe to touch with no unwrapping required - just drop it in and your done. Our convenient pre-measured Power Pack pouches are a breeze to use and will keep your laundry smelling fresh and clean, wash after wash. Washer Fresh is incredibly cost effective - just use one Power Pack pouch per month. Washer Fresh dissolves completely, is septic-tank safe, environmentally friendly and biodegradable. 1 Package of Washer Fresh contains 3 Power Pack pouches.